WASHINGTON (CNN) - The Trump administration is considering appointing an outside expert as a special envoy to deal with the North Koreans alongside Secretary of State Rex Tillerson if talks advance to a serious stage, according to an administration official. There is an ongoing debate in the Trump administration as to North Korea's intentions in wanting to talk and whether such talks would lead to serious steps toward denuclearization, with two distinct camps pushing their views to the President. Although officials caution no decisions have been made, the consideration of an outside expert underscores the administration's lack of depth on what is arguably the world's most pressing foreign policy challenge. The State Department's roster of senior diplomats dealing with and experienced on North Korea is seriously depleted. The top diplomat dealing with North Korea, Joseph Yun, is departing his post this week and the US has been without a permanent ambassador to Seoul since Trump took office. The State Department's assistant secretary for East Asia, in place in an "acting" capacity, still hasn't been confirmed. Though Susan Thornton has become one of Tillerson's most trusted aides, her broad Asia portfolio could necessitate a point person who deals just with North Korea, one official said. The vacancy of the key ambassadorship in Seoul, coupled with the loss of a veteran envoy in Yun, has revived concerns that the US lacks diplomatic experience, a notion that State Department spokeswoman Heather Nauert has dismissed. "The State Department has 75,000 people that work for us around the world," she said February 27. "To imply that Ambassador Yun is the only one who's capable of handling North Korea would simply be wrong. We have a deep bench of very experienced people." Now, officials say, the administration is considering a search outside the department for the brainpower and experience to maneuver one of the world's trickiest and most threatening foreign policy problems. 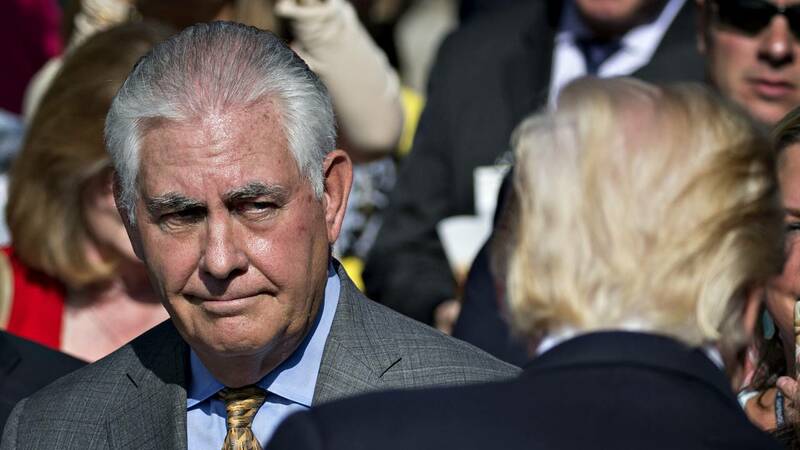 Officials said the outside expert would be called upon to handle technical negotiations before Tillerson would step in to be at the table toward the end of any negotiation. Officials said there's no sense yet on who might be tapped to fill the role. The choice of outside expert could indicate which way the administration is leaning in its stance on Pyongyang. There have been conflicting signals, as two camps within the administration have pushed for starkly different approaches. Tillerson, along with Secretary of Defense James Mattis, has pushed for an approach exerting maximum economic pressure and diplomatic isolation on North Korea. The aim of the squeeze is to to force Pyongyang to the negotiating table. On Wednesday Mattis said he is "cautiously optimistic" but there has been "optimism before" when asked about the latest developments. Other voices in the White House, including national security adviser H.R. McMaster, have spoken openly about the need to consider a pre-emptive military strike against North Korea, should it threaten the US or continue to develop its nuclear weapons and missile capabilities. One indication of where President Donald Trump might be leaning are reports that he met Wednesday with John Bolton, the hawkish Bush administration ambassador to the UN, who argues that a pre-emptive strike on North Korea would not only be legal but also effective at curbing the threat. The two spent a major part of their time discussing North Korea, according to an administration official familiar with the meeting. One camp of officials within the administration would likely be aligned with Bolton. This group believes that North Korea is not serious about its outreach and is just playing for time to continue its nuclear development -- as it repeatedly has in the past under prior US administrations. One senior administration official compared Pyongyang's approach to the iconic "Lucy and the football" running gag from the Charlie Brown cartoon, in which the Lucy character always whisks away the football just as Charlie Brown thinks he's about to land a kick. While in the past it was possible to test the North Koreans and let the process play out, the official said, the US and its allies are now running out of time as North Korea inches closer to mastering a deliverable nuclear weapon. After a November ballistic missile test, Mattis said that Pyongyang already demonstrated the ability to hit "everywhere in the world." The question is whether it has miniaturized a nuclear warhead and mastered a missile's re-entry phase. Amid heightened tensions, China proposed a "freeze for freeze," meaning a freeze in North Korea's nuclear and missile testing in exchange for a freeze in joint military exercises between the US and South Korea. But the US group of officials who take a hardline approach say that is a nonstarter. They argue that there can be no meaningful negotiations until North Korea takes some initial demonstrable steps toward denuclearization. That doesn't preclude "talks" in the interim, they say, as Tillerson has made a distinction between talks and formal negotiations. On Wednesday two defense officials told CNN that the US has scheduled the annual joint military exercise with South Korea, known as Foal Eagle, for March 31. The Foal Eagle exercise, which was originally scheduled to take place during the Winter Olympics, involves thousands of US and South Korean troops and is the largest bilateral exercise involving those forces. The Pentagon officially declined to comment on the scheduling of Foal Eagle. In contrast to the hawks, another group of administration officials see North Korea's overture as a good sign, because it will reduce tensions and give diplomacy more time to work. Moreover, they point out that North Korea has put denuclearization on the table, which is a shift from the position Pyongyang has previously held. One senior administration official called it "a quite important turn" that hasn't come at a large cost to the US. Another positive sign is a "North-South" summit planned for next month between South Korean President Moon Jae-in and North Korean leader Kim Jong Un. Another senior official called this a "very significant move" that suggests South Korea is inclined to see how far it can go in improving relations. This official did acknowledge, however, that this detente does leave the US on the margins. Correction: This story has been changed to reflect China's role in the "freeze for freeze" proposal.